I grew up believing that wearing a pair of jeans was sinful. My mother in law also believed that it was not okay to wear jeans. 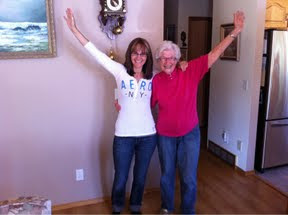 In fact, my mother in law is 84 years old, and this is her first pair of jeans! I think they look great on her, and just the fact that she is wearing them brings an element of freedom to her life that she did not have before. When I try something new on in my life after years of always doing it the same old way I experience a new freedom. God shows me light. He reveals Himself to me in a new and bigger way. It's good. He lifts the veil. Jesus, Say That Again. Give me The Jeans, challenge me today to grow, change, learn, and live Your way. sweet picture of the two of you!!! !